Krazy Krouse Kids: 1,2,3,4,5,6,6 PARTY!! 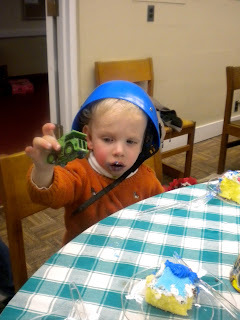 For the second year in a row, we had a big birthday bash for all the January babies. 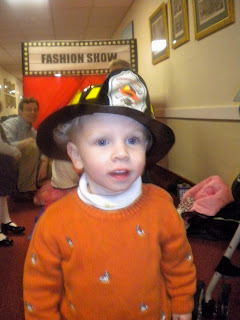 We had little boys turning 1,2 (Tucker), 3, 4, and 6 and girls turning 5 and 6. 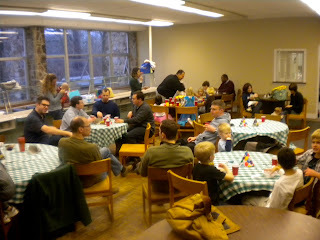 Almost all of the seminary children were in attendance and we had a great time. Because there were so many January Birthdays, we had to have in at the seminary rather than in someone's house. It was crazy! The kids played dress up and painted nails in the fashion show tent, played limbo, played with playdough, and ate cake and other snacks. We also had a pinata which was lots of fun! It was a perfect rainy Sunday afternoon for the kids of the seminary. Caroline and Tucker came home and went right to bed...they were exhausted!